The North American Handmade Bicycle Show comes to Sacramento. 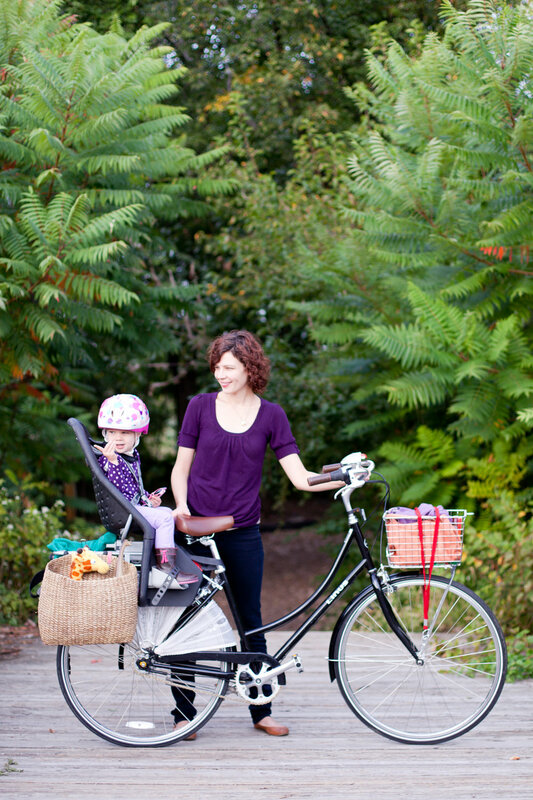 Emily of Sac-based, Squid Bikes, talks about her inspiration from surf and skate culture. Later she leads a ride to the official-unofficial after-party at Squid HQ. We also visit with Chris McGovern to chat about Rock Lobster influences. Behind the scenes with Phony PPL. We talk about being artists on the road and experiences with synesthesia. SF based artist, Laura Cohen, explores movement and surprises in her work. While this ferry looks ideal, our first night on Cres was not. Arriving with seconds to spare we ran to the ferry with bags falling out of our arms. We made it on just in time and finished building our bikes while clouds moved in. Our first night on Cres we rode about 500 meters in pouring rain to the forest and quickly set up camp. I awoke to a flat tire (should of brought extra sealant, all dried up 😐). I threw a new tube in as it continued to rain. We looked at each other seriously questioning how relaxing this “vacation” was going to be. Luckily the rain quickly blew away and the sun greeted us. The funny thing about these little islands is how quickly the weather and terrain changes in just a few KM’s. 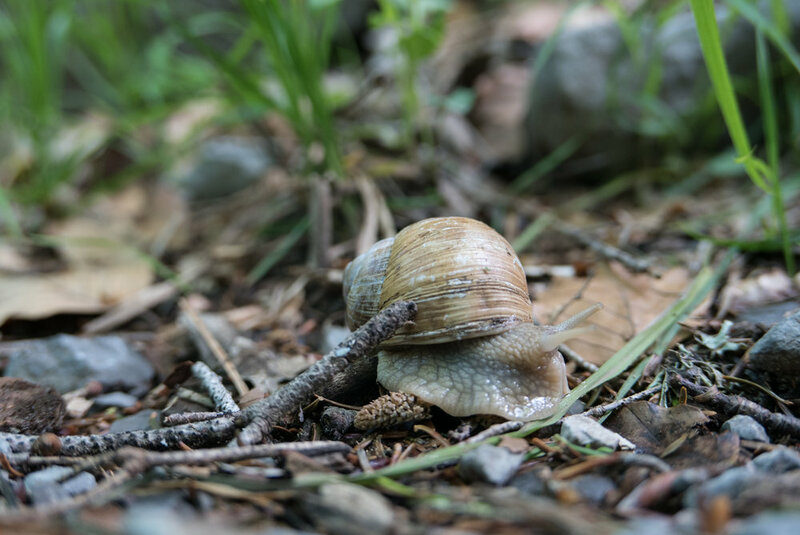 Going from rocky, arid, hot, dusty, to rain, hail, thick clouds, and dense wet forest. 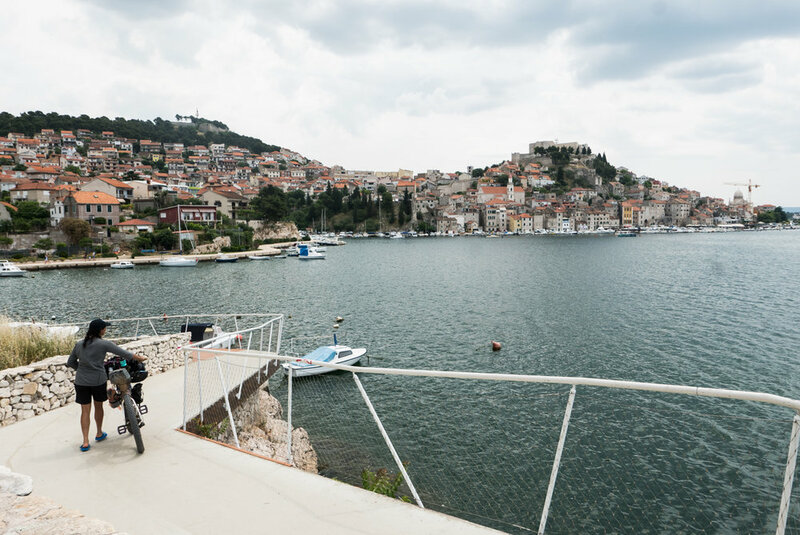 After Cres, we modified the @bikepackingcom route on Krk, heading instead down to Rab for another day of islands riding. All the while staring at Velebit on the mainland, a constant reminder of the mountain days to come. Velebit was calling. 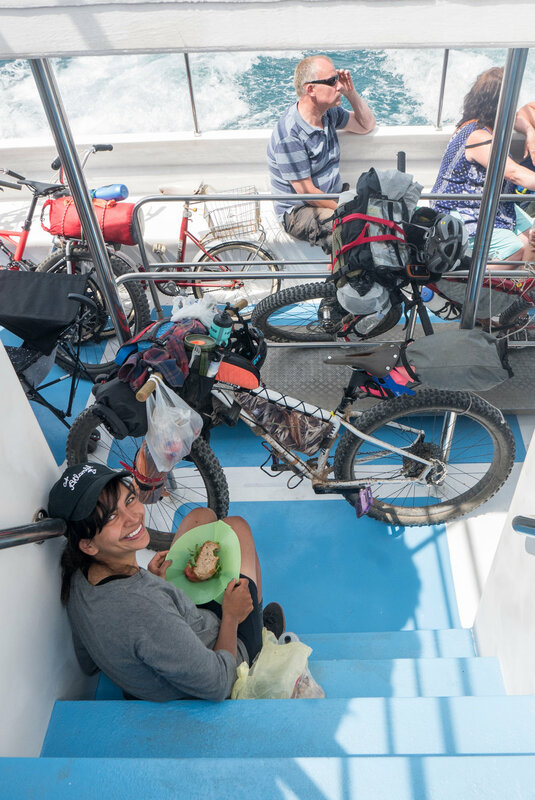 We arrived back on the mainland at 5:30pm, taking a ferry from Rab to Stinica. We had a big climb ahead to Alan (4,600 ft in 15 miles), np we could knock it out in 3 hours, right? WRONG. It was getting dark and we weren’t even halfway to the hut. Scrambling to find flat ground after endless switchbacks, we gathered grass and brush to pitch our tent on something other than sharp rocks. The morning we climbed another 2 hours to the summit, all the while staring in awe behind us of the islands we rode days before, sitting thousands of feet below in the sea. We cruised on gravel forest roads between karst towers watching the landscape change again from the dry coastal side over the ridge to dense forest a patches of snow. Big climbs mean big descents. We enjoyed screaming down ridges again with glimpses of the sea and hanggliders. We refueled in Gospic and began a sobering ride through the war-scarred valley, navigating areas still littered with mines. Out of the valley and right back up! We found ourselves back on chunky climbs and descents. When it gets loose and technical, downhill is less relaxing and more taxing as it takes all your focus to stay upright. The views sure didn’t hurt and the weather kept in our favor. 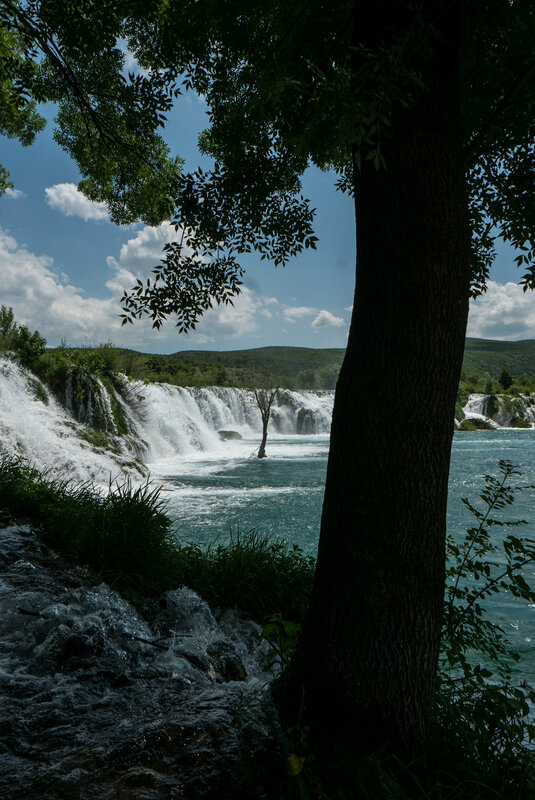 The waterfalls were alive with lush grasses and the hills with goats and poppies. 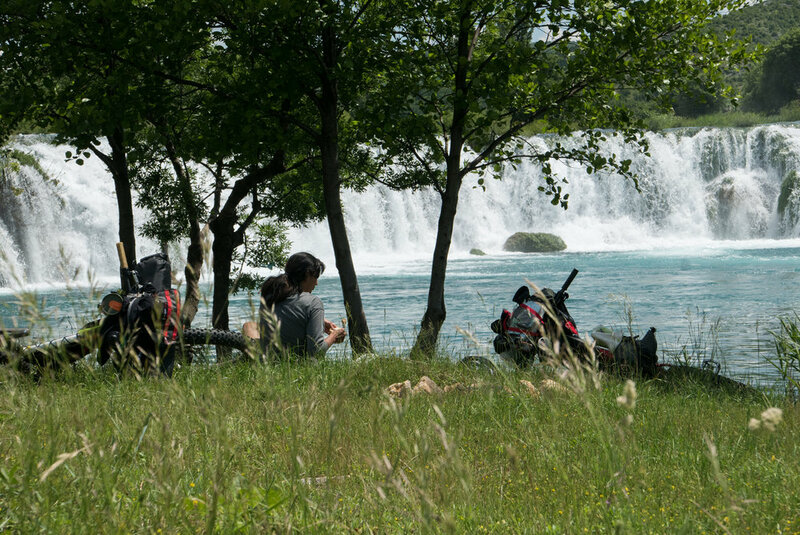 We met a family of German campers who drove through the night to paddle the Krupa river. Slackpacking. I haven’t owned a proper mountain bike for almost 10 years and it was deeply missed. Taking pictures of my friends dirt jumping and doing dumb stair gaps is what made me fall in love with photography and bikes in the first place. Finally this winter I got a new bike! It’s nothing special, but this kind of bike never even existed when I started riding, with a 27.5+ tires and a slacked out geo I knew I could get into some trouble again. 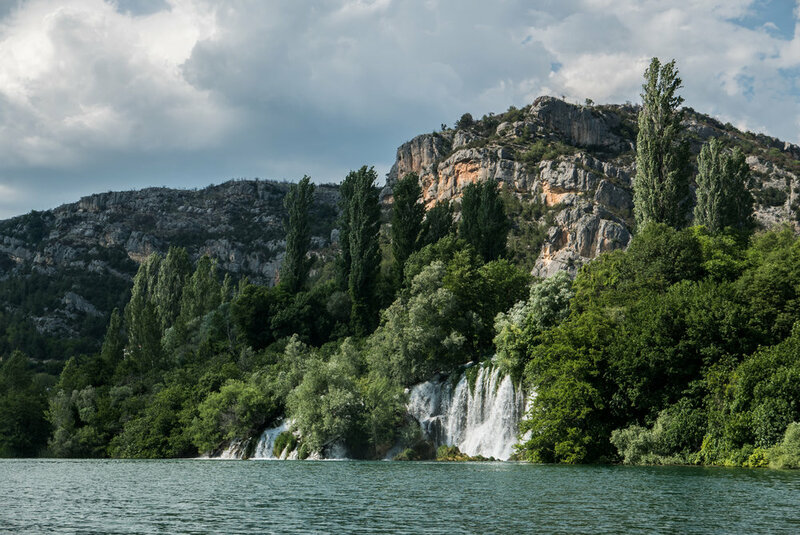 Our final days to Split treated us to the gorgeous falls in Krka (we may of slept in the park after-hours, being too tired to ride to a real campsite). The treat to bike packing is the solitude. Unlike other tours I’ve done, you could ride all day with out seeing any cars. The best part being reuniting with a village or city the following day and enjoying awesome descents ripping into town. Our final day proved the hardest of the whole trip, 3 hours of hike-a-bike (basically bushwhacking) up a thorn adorned climb. After an afternoon in Split we headed to Brac to reunite with Marko one last time and then pack up the bikes and off to Venice. The catalyst for this trip was to visit dear friends Marko and Ana in their homeland. I worked with Marko for years in DC before he returned to Zagreb. Marko stoked my love for endurance sports and fresh bread. I'll never tire of their unique blend of deadpan and goofy sense of humor. They are warm beautiful people and my life is all the better for them. Also big thanks to Snehee for being an amazing partner in every sense. Last thanks to bikepacking.com for being a great resource and inspiration for the culture. A portrait series dedicated to the wonderful people the make up the bike community. D.C. based bike team, Great Eskape, took its name from graffiti painted on the pumping station nested in the Potomac River. A spot not far outside the city, but off the path enough to feel all its own. Attracts the company you'd find under bridges, on piers, or in the woods, in other words good people. Every other week Great Eskape team members invite the local bike community together to their riverside cafe. The Community Wellness Collective organized fitness classes in the Anacostia Arts Center. Founder and Ward 8 resident Khadijah Tribble recognized that access to fitness classes and education should not be determined by where you live. She also knew that folks are more inclined to participate when programs are run by people from their neighborhood and share simalar backgrounds. These are just a few of all the awesome makers at @thisismadeindc #blackownedbusiness night. The Bluemont Connection co-founder, Idit Knaan shares her take on Sabich, an Iraqi and Israeli favorite. Idit says she is inspired by chefs like Ottolenghi , who celebrate vegetables, rather than treat them as a side or an afterthought. Food is never an afterthought at The Bluemont Connection, the cooking is taken as seriously as the cycling. Serious in the most wholehearted way. Cofounders Eric and Idit are warm people passionate about connecting others with beautiful rustic roads and refreshingly real food.